Up until now, most of the Android forensics research has been focused on areas like the acquisition and analysis of the internal flash NAND memory, SD Cards, understanding the YAFFS2 file system and scrutinizing APK files for malware analysis, among others. However, little has been written about memory acquisition and analysis of Android devices, one of the most active areas of research in the field of computer forensics. Volatile memory, also referred as RAM, is a critical piece of evidence for every forensic investigator since it contains a wealth of information that is gone as soon as the device is rebooted or turned off (at the end of the day that’s why it’s called volatile, huh). The following examples assume you have installed the Android SDK and other prerequisites as described later in this post. I also assume that you are familiar with the basic operation of these tools and that at least you know how to create and manage an Android Virtual Device and access it using adb. An alternative method for dumping the contents of memory of a running process involves using the Dalvik Debugging Monitor Server (ddms), a tool that comes with the Android SDK. All you need to do is to select a process and click on the “DUMP HPROF file” button to dump the contents of that process onto disk. However, none of the methods described above can dump the ‘full contents’ of memory. While they allow you to perform some “live analysis”, it wasn’t possible to obtain a full capture of the device’s RAM in the same fashion that it was possible in Linux with tools like fmem. At least, not until DMD came up. So it was certainly a glad surprise to read about DMD (now called LiME Forensics) when preparing for my talk at the 1st International Symposium for Android Security held in Malaga last week. If you read Spanish you can find the slides for my talk “Latest Advances in Android Forensics” here. This tool was first presented by his author, Joe Sylve, earlier this year at Shmoocon 2012 in Washington DC, and it’s the first tool that allows the analyst to capture full contents of RAM from Android devices. While the tool was announced this week, it was effectively available from google code for almost a month, which allowed me to play with it and demo it for my audience last week. As I mentioned during my talk, the installation of the tool can get ‘tricky’ so I thought I’d better share with you the steps I took to compile it and how to use it. The first and foremost thing to know before diving into the instructions is that LiME Forensics is a Loadable Kernel Module (LKM), and as such it has to be compiled for the specific kernel of your Android device. Therefore, in the rest of the post, I will show how you can build a kernel of your own, how to load it onto the emulator and how to cross-compile the LiME LKM so you can test it with your customized kernel. I have to say that I also exchanged a couple of emails with Joe Sylve trying to figure out what was wrong and I have to say he was very responsive (thanks!). The following instructions have been tested successfully on Ubuntu 11.10, with Java SE Development Kit 6 Update 31, the Android SDK r18, NDK r7c and with the emulator running an Android Viritual Device (avd) based on Android 4.0.3 (API 15). You can place them anywhere, but take note of that since you will need to include those directories in your path, as shown later in this post. Next we will get the source code for the Android SDK and other tools to compile those. This allows your client to access the android source repository, downloading the latest version of Repo with all its most recent bug fixes. You will need to download and untar the kernel source for your device. If you are dealing with a real device go to the website of your device manufacturer. For our test we will use the “goldfish” source code only. 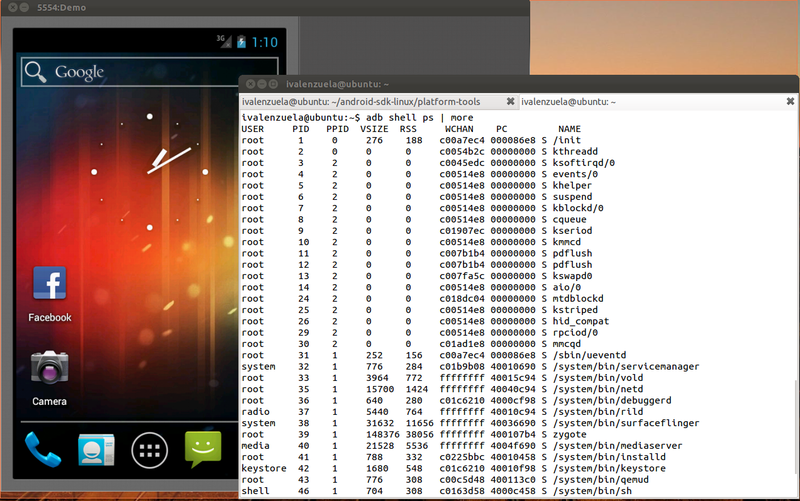 Goldfish is the name of the kernel branch for the Android emulator. Note that the location of these tools (JDK, NDK, etc…) might vary depending on where you placed them in the previous steps. An alternative to this last step would be to run make ARCH=arm goldfish_defconfig from the goldfish kernel source directory. The next two steps are critical for the success of this exercise, as we will be preparing the kernel source for our module. Otherwise add those lines. These options have to be enabled for the kernel to be able to load and unload modules. 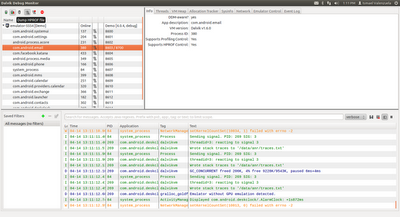 Note that we are using the cross-compilation toolchain provided by the Android NDK with the option CROSS_COMPILE. Obviously, the CCOMPILER variable must be correctly set (see the excerpt of my .bashrc file above). 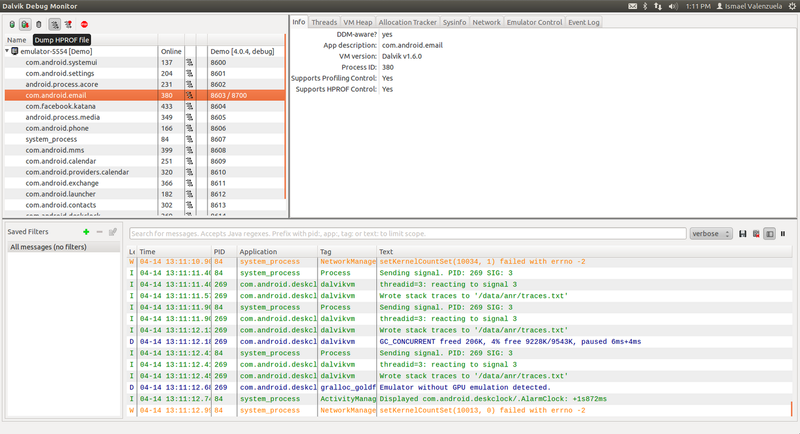 Note that I also had to add the EXTRA_CFLAGS=-fno-pic for make to work with the latest NDK. This is not included in the LiME documentation, but it worked for me. In this case, Demo is my Android Virtual Device (AVD) which I previously created using the AVD manager. It’s running API 15 (Android 4.0.3). All you need is lime.c and a Makefile that will prepare the module for cross-compilation. Save and place this Makefile in the directory where you’ve placed the source for LiME. Again, make sure the location of the directories included above corresponds with your install. Finally (at last!) you are ready to cross-compile the kernel module. If everything went well, you should have a LKM file called lime-goldfish.ko and you deserve a short break with a good cup of before moving on. In the second part of this post we will look at how to use this Loadable Kernel Module to dump the full contents of RAM of an Android device and what kind of information can be retrieved from this capture. As far as I have inderstood, you explain the use of Android Debug Bridge tool here in your post. Am I right? I'm getting hung up on the step "make ARCH=arm...", because it's complaining that there's no rule to make modules_prepare in the Makefile. I'm no expert on the whole building process; any idea what I'm missing here? Is there a part II? Link? If not when are you planning to post it? Thank you so much! Part 2? If your source device (Samsung Galaxy S3 mini) does not contain /proc/config.gz, can you use another config related to the source kernel? 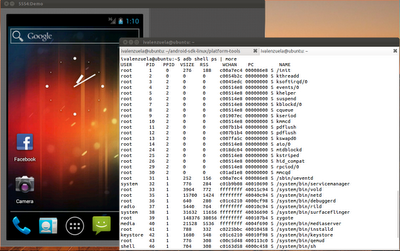 Is the explains the Android Debug Bridge tool here. If so How can I use it/ Will that is applicable for all the versions currently I'm using Ice cream Sandwich. Hello, the problem of your approach is: that one have to compile a kernel, flash the image etc. of a phone - that means that you modify the original state of an e.g. compromised device. This contradicts to the forensic guideline, not to change the device - isn't it. Anyway is there a current method to intrude the kernel gaining root mem imaging rights?